A message I need to hear. Constantly. I’m so quick to find myself discontent, with almost no reason to. I married into my home. While Joel and I were dating, he made the move from Carrboro to Durham, where he and I both worked. I had the privilege of helping him with the house hunt. Realistically, this could have been a disaster for our relationship. Luckily, Joel and I have similar values when it comes to homes: 1) Old charm, 2) Location, 3) Long-term Potential. Check, check, and check. We live in a home built in 1950, located in a quiet neighborhood with loads of conveniences (huge park, dog park, community center with pool and gym, children’s museum, another park, and loads of trails in and around the neighborhood) that’s within 15 minutes drive of both of our jobs. We can also walk to the best Peruvian food around, objectively the best tacos in the area, and Pelican’s. … so the location is basically the best. In terms of long-term potential, this house is small (2 small bedrooms and 1 bathroom), and that’s definitely a downside when it comes to having children. On the other hand, it sits on a large lot, and we live in a neighborhood where adding an extra bedroom/bathroom would definitely pay back in terms of return. That’s definitely in our long-term plan, and until then, we are happy to know we have a well-built home. So I have about a thousand reasons to love the home I have. But I don’t always. I focus on the things we don’t have: a dishwasher, a pantry, a paved driveway, a ventilation hood over my stove (I pretty much only mind this one when I’ve burned something), storage… I could keep going. 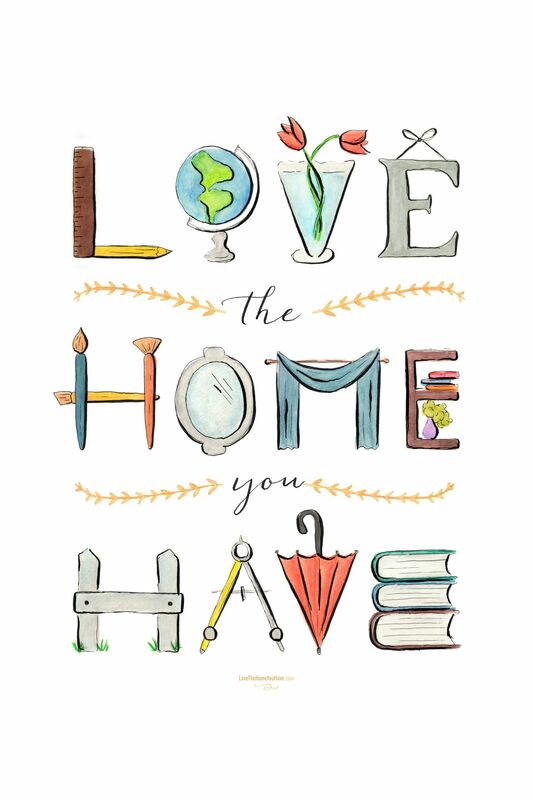 But I’m trying really hard to love the home I have. And really, what’s the point of listing my home’s shortcomings, when it has such a long list of things I love about it. And while I loved my home when I first moved in, I have to say, that I enjoy it a whole lot more now than I did then. For one, it actually feels like my home now. For two, Joel and I have been steadily fixing this old house up since two months after we got married when I woke up to water dripping from the ceiling in the kitchen. It’s gotten a new roof, tons of new pipes, a little bit of new paint, a whole lot of cleaning. It’s gotten new furniture, new ceiling fans, and new-to-us kitchen faucet and fridge. But more than any of the new stuff, I’ve gotten to know the house better. We’ve established a life here, and it’s like we’ve gotten to know the house better, and it’s gotten to know us better. Over at The Nesting Place, Myquillyn talks a lot about making your home work for you. I’m figuring out how to do that, and I’m loving things so much more. Last spring, I redid our living room for less than $150. While I’m fully aware that $150 is still a lot of money, considering the purchase of a new couch and the reupholstery of two chairs, I’m pretty happy with that. In general, these days, I’m pretty thrilled with our living room. It works for us practically, but is also pretty enough I can relax in it. The bedrooms, though nothing tremendously special, work for us as well. We’ve figured out how to store our clothes and books just perfectly to still give us plenty of room in our bedroom. And we’ve finally cleaned and set up the second bedroom in preparation for our foster children, which we’re expecting to be licensed for late spring/early summer. And our bathroom, ugly as it is, is veritably massive for a 1950’s home, boasting double sinks, a large tub, and plenty of room for several people to get ready at once. This home is really starting to work for us. Except the kitchen. It’s spring break, and my mission is to change that. But in the spirit of loving the home I have, let’s talk about what I really do love about this kitchen. This peninsula gives me miles of counter space. Seriously, I’ve never seen a kitchen this size with so much useable counter space. I know this seems like a given, but I can’t tell you how many older homes Joel and I looked at where it wasn’t. I’m so incredibly thankful for this stove and oven. And I’m also thankful for the fact that it has a gas line going right to it, because eventually, I know I’ll get a gas stove. Woot! This little spot of counter right there sandwiched between the stove and sink. Yep, it’s exactly the size of a standard drying mat. Love. But no kitchen is without its failings. This kitchen primarily has a problem with storage. With few upper cabinets, and even fewer lower cabinets (the peninsula has almost no cabinets beneath it), this is a major issue. Also, the funky shape of said peninsula means I can’t buy standard shelves to go beneath it because of all the odd angles. Lack of storage coupled with my Costco obsession means I’m going to need to get creative to keep all those extra cans of tomato paste accessible. And then there’s also the issue of my giant supply of gluten free flours (Joel refers to it as my “chemistry set”). I’ve got my work cut out for me this week.